A busy suburban Minneapolis pediatrics practice, with more than 40 providers and six locations, wanted to find ways to better serve their patients, particularly by offering them the peace of mind of being able to schedule appointments with the provider of their choice at any time. South Lake Pediatric Group worked with the Patient Relationship Management (PRM) Services team from eClinicalWorks, implementing and training all staff on healow Open Access® for online appointment booking, Kiosk for check-in, and Patient Portal and healow apps for stronger Patient Engagement. South Lake Pediatric Group’s patients love the new tools available to them, and now enjoy greater access to their physicians and the ability to book appointments at their convenience, day or night. More than 80% of the practice’s families use Patient Portal, and nearly all are connected through eClinicalWorks Messenger. 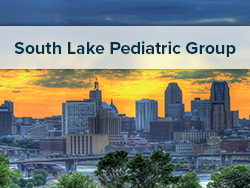 South Lake Pediatrics offers comprehensive pediatric healthcare services at six locations in the western suburbs of Minneapolis, Minnesota — in Chaska, Eden Prairie, Maple Grove, Plymouth, and two sites in Minnetonka. The practice’s dozens of providers have increased patient satisfaction by adopting healow Open Access®, which makes providers’ schedules available to parents online. And each location continues to implement additional Patient Engagement tools to better serve their patients.